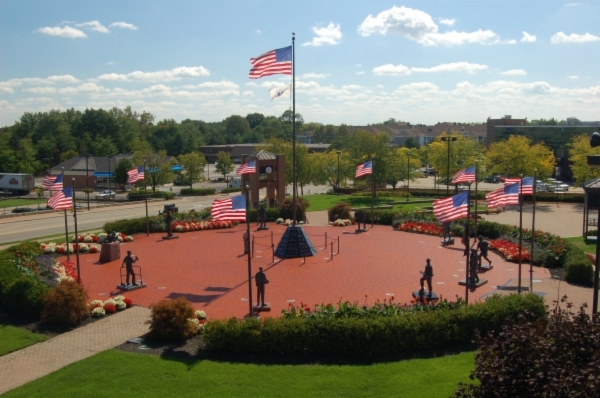 The Blue Ash Bicentennial Veterans Memorial Park, formally dedicated on May 25, 1991, and financed by the City of Blue Ash, is located in downtown Blue Ash adjacent to Towne Square at the southwest corner of Hunt and Cooper Roads. The memorial is a one-of-a-kind national caliber memorial with 11 life-size sculptures representative of each of the following: American Revolution, War of 1812, Mexican War, Civil War, Spanish-American War, World War I, World War II, Korean War, Vietnam War, Persian Gulf War, and the War on Terror. The sculptures have been installed in a circle to portray that the sacrifice and importance of all American veterans is equal. 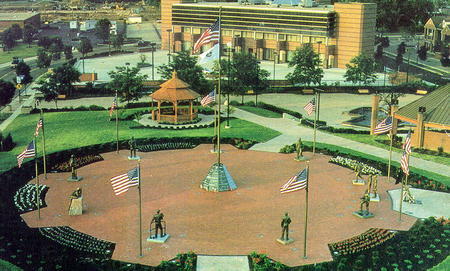 Behind each sculpture is a 20-foot bronze-colored flagpole flying the flag from that era. 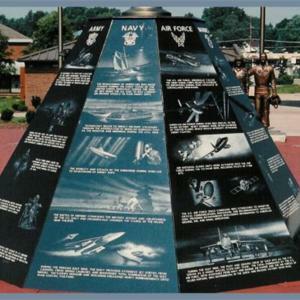 Another major portion of the memorial, in the center of the 100-foot diameter circle of sculptures, is a 40-foot high bronze flagpole mounted upon a ten-foot wide by six-foot high black granite nonagon base that depicts unique etchings of various veteran scenes, famous quotes, and other historical and military information. 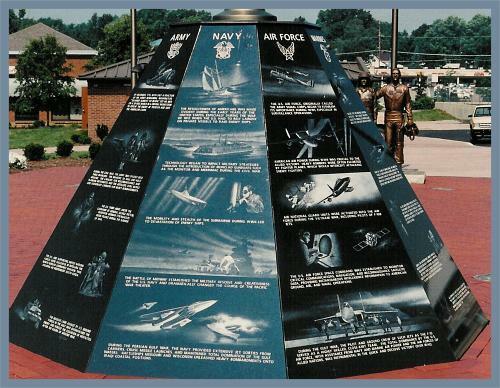 The illustrations on the granite nonagon, as well as the design of nine of the ten sculptures, at the Blue Ash Veterans Memorial were created by Cincinnati area artist Gary Carson. 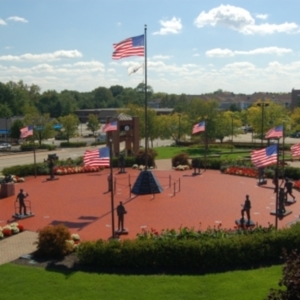 : Ken Bradford, “Blue Ash Bicentennial Veterans Memorial,” Ohio Outdoor Sculpture Inventory, accessed April 22, 2019, http://oosi.sculpturecenter.org/items/show/465.